President Harding is noted for signing into law the first federal child welfare program, he successfully negotiated with striking mining and railroad workers by supporting an 8-hour work day, oversaw a 50% unemployment rate drop during his administration and his love for the Boy Scouts of America. The 33rd White House Ornament chosen to represent President Warren Harding is a miniature replica of his personal Pullman Superb railroad car he used in a cross country political tour. Built in 1911, the Superb is the second oldest steel private car in existence and outfitted with a public address system for whistle stop speeches and a transmitter for nation-wide broadcasting of Presidential speeches. The Superb is 73 feet 6 inches in length, 9 feet 9 and 1/2 inches in height, 11 feet 2 and 1/2 inches in width, and weighs 165,000 pounds. It includes an observation room, five bedrooms (equipped with toilets and sinks), porter's compartment, kitchen, and pantry. In 1923 the Superb was the focus of the nation as it carried the flag covered casket of its most famous passenger surrounded by bouquets of wild flowers from San Francisco, California to Marion, Ohio where the body of the President was buried. The Superb train car was later donated to the Atlanta Chapter, National Railway Historical Society in 1969 by the Seaboard Coast Line Railroad (SCL) for display at the Southeastern Railway Museum. (SCL merged with the Chessie System in 1982 to form CSX Corporation.) SCL used the Superb as Business Car #301 for transporting company officials. 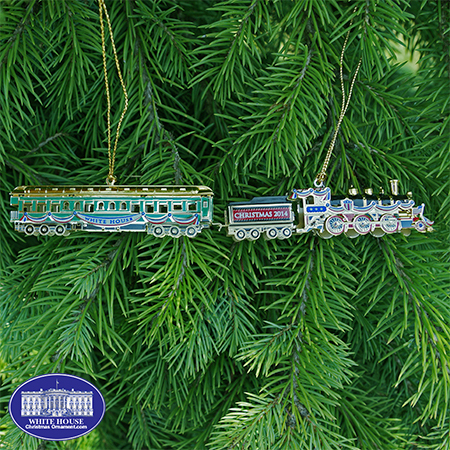 The 33rd annual White House Christmas Ornament manufactured in two miniature pieces, the Suburb and a steam locomotive that represents one of the many that pulled this famous Presidential car. The Suburb and the locomotive are both crafted in 24 carat plated gold with red, white, blue, green, black, and white enamel finish. The miniature Superb and the locomotive are each 3� inches by � inch individually. The miniature locomotive can be hooked together as one ornament or hung on the tree individually. Don't miss out on purchasing your official White House Ornament Today.